The MicroBiHome is a mixed media installation developed by the University of Salford, inspired by research into the mircobiome taking place in the School of Environment and Life Sciences. Led by Dr Chloe James, the project brings together artists, scientists, technicians, and communicators to reveal aspects of microbiology to a general public. Bacteria have a huge part to play in human physiology – preventing disease, digesting our food and keeping us healthy. At #ReadYourDNALive, we combine the latest cutting-edge DNA-sequencing biotechnology with visual and audio displays of the data, and explore the latest research surrounding this fascinating world of bacterial diversity. In this virtual reality experience, players learn how the biofilm responds to different doses of antibiotics. The 3D environment in which they are immersed has been created from real data acquired with a confocal microscope. Players are guided through this interactive visual journey, where they get to explore the results of a real-life experiment, and learn about the formation and destruction of biofilms..
A science art collaboration with Salford University. Exploring the microbiome of the human gut and its significance to health, wellbeing and the critical medical challenges facing us. This interactive space brings a 3-wall, projection mapping environment together to depict the inside of our stomachs. Made by the University of Salford’s Maker Space, these 3D models of viruses and bacteria really help to engage the public to talk about the public. We also have miniature versions that we give away to visitors. By taking mouth swabs, visitors are able to create their own bacterial self portrait, which we grow in the lab. Effective global action across health and science disciplines that tackle the problem of increasing antibiotic resistance (AMR) development and decreasing access to effective antibiotics must engage the public. 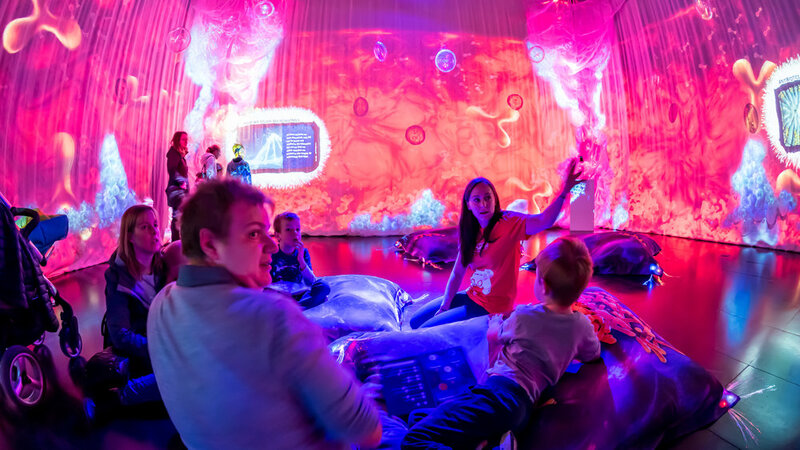 MICROBIhOME is a suite of interactive sci-art activities designed to engage families, young people and adults on topics around their “microbiome” (the trillions of microorganisms inhabiting our bodies) and AMR. 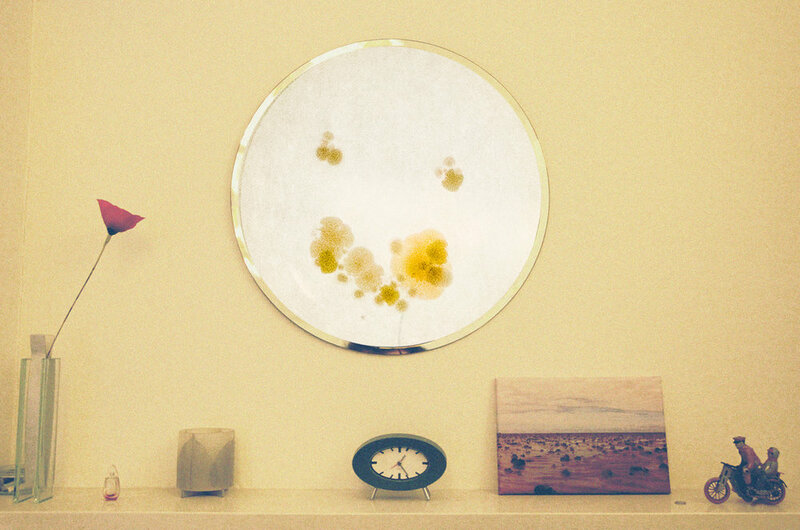 MicrobiHOME creates public curiosity and informs how microbes interact with the human body, the roles that different microbiomes (e.g. skin, gut) play in maintaining human health, the impact of antibiotic use and the importance of antibiotic stewardship. Drawing on our research into microbial biofilms, DNA sequencing, AMR development and physiology, and our science communication expertise, we will deliver a programme that invites public exploration of the microbiome and AMR in new and exciting ways. Our academic, industrial and artistic partners will develop large scale, immersive installations that combine physical, audible and virtual reality microbiome experiences. Visitors sample their microbiota, explore, through participation, the underlying science and technologies used in microbiology, and experience audiovisual microbial landscapes to learn about microbial diversity and the development and impact of AMR. With the help of trained student microbiology volunteers and creative writing activities with a poet, participants are invited to reflect on the relevance of these experiences in their everyday lives. The delivery of MicrobiHome at festivals would not be possible without our amazing volunteers, all of whom are listed below. Thanks to every one of them for their time and commitment.